Valpolicella is one of the most beloved red wines of Italy. 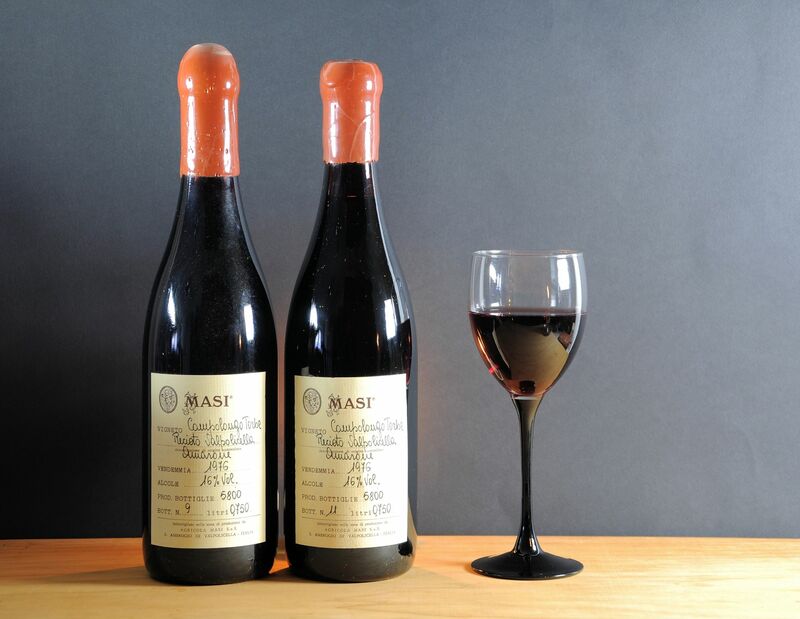 Produced in Veneto, it is renowned for its rich fruit aromas of black cherry and cranberry, its soft tannins, and its woodsy-spice-wild berry-bitter almond flavors. Valpolicella is also a wine of many faces. It may be produced in normale, ripasso, amarone, and recioto versions; in superiore, riserva, and spumante styles, and in the Classico and Valpantena subzones. That’s a lot of versions of Valpolicella! But the good news for we perpetual students of wine is that all of the variations of Valpolicella require the exact same palate of grape varieties, and it’s fairly simple at that. For starters, there are only two grapes that are required to be used in Valpolicella. They are Corvina and Rondinella. Corvina must be at least of 45% the blend and Rondinella must be present at a minimum of 5%. So that’s the legal baseline. Above and beyond that, 25% of the blend may be made from a long list of different grape varieties (defined as “red grapes suitable for cultivation in Verona”) with the caveat that no single accessory variety may comprise more than 10% of the total blend. King Corvina: Corvina, which I call King Corvina, is considered to be the superior grape in Valpolicella blends, and may comprise anywhere from 45% to 95% of the total. 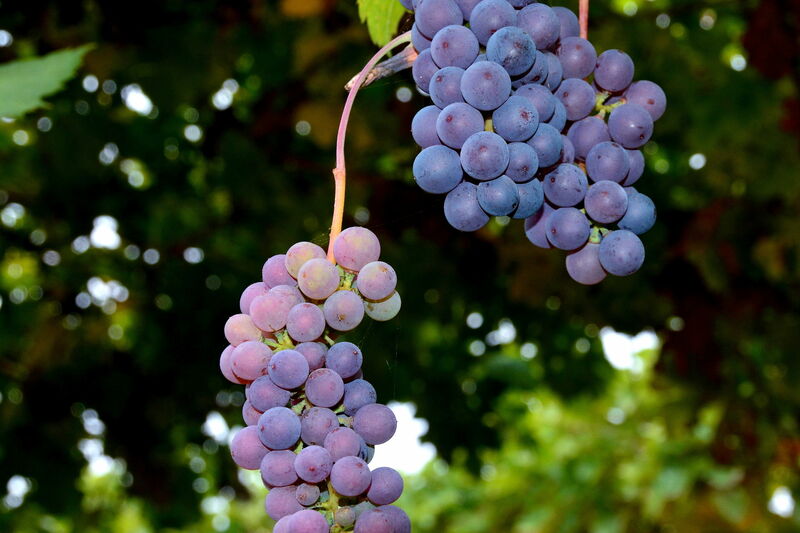 This grape is also known as Corvina Veronese. The name may have come from the word corvo, meaning “crow” (in reference to the color of the berries) or from the local term cruina, meaning “unripe” (and referring to its late maturation). Corvina provides a light sour cherry flavor, fresh acidity, and a hint of bitter almond to the wines of Valpolicella. Ruby Rondinella: Rondinella, which I call Ruby Rondinella, is included as part of the Valpolicella blend for its bright ruby-red color, and fruity, cherry-esque flavors. It must be at least 5% of the blend (and is permitted to be up to 30% of the total). Rondinella is the offspring of Corvina and is thought to be named for the term rondini (meaning “swallows”), in reference to the color of the berries. 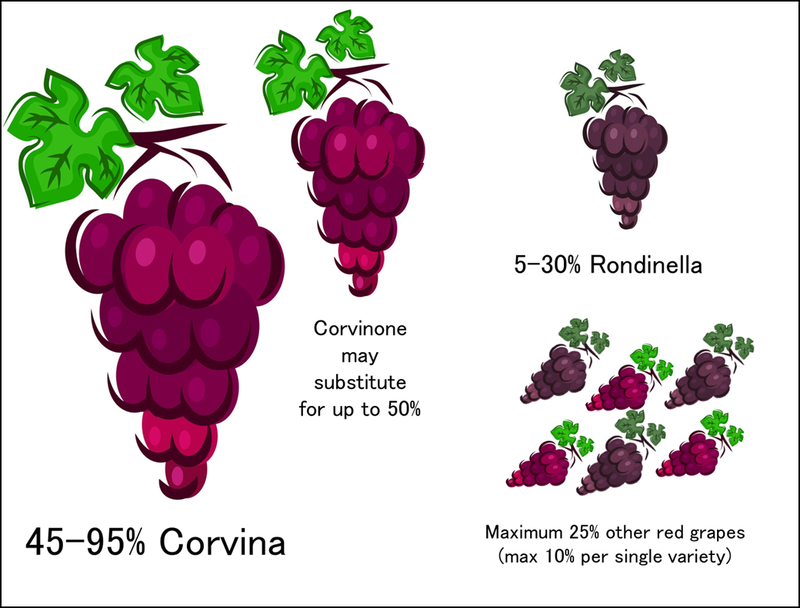 Cousin Corvinone: I call the Corvinone grape Cousin Corvinone because it was previously believed to be a clone or mutation of Corvina (and thus, technically, the same grape). However, in 1993 (God bless DNA profiling) it was proven to be a distinct variety. After it was discovered to be its own grape, the disciplinare of the Valpolicella wines were updated to allow Corvinone to continue to be used in the wines. As such, it is now allowed to be substituted for up to 50% of the total amount of Corvina used in any given blend. Minor Molinara: Molinara freaks people out in reference to Valpolicella, and for good reason. It used to be a required part of the blend, and lots and lots of wine reference materials still state it as so. However, the rules were recently changed, and now Molinara is allowed but not required. The grape is now considered to be not-so-high quality, rather pale, and prone to oxidation (thus its demotion). However, some old-vine Molinara is grown in Veneto—specifically at the Masi, Carlo Boscaini, and Villa Bellini estates—and is used to produce some high-quality wines, some of which are bottled as a (very pale, almost rosé-like in appearance) varietal under the IGT Veronese. There are reportedly only about 3,300 acres (1,350 ha) of Molinara in Veneto, and these days it definitely plays second fiddle to the Crovina/Rondinella team in Valpolicella. For this reason, I call it Minor Molinara —but Molinara is neither gone nor forgotten. Obscure Oseleta: The Oseleta grape has been found to be very close to Corvina in terms of both DNA profiling and character. As such, it is an allowed grape in the Valpolicella mix, but it very rarely used. It was—once-upon-a-time—very close to extinction. Luckily, it was recovered beginning in the 1970s, primarily around the small village of Fasola-Pigozzo. Even today, Oseleta is grown in very small amounts (50 acres/20 ha) in the Valpolicella zone; as such, my nickname for the grape is Obscure Oseleta. Crazy Croatina: Croatina has earned the nickname Crazy Croatina due to its involvement in one of the craziest grape-name schemes in all of viticulture. See if you can follow this: Croatina is also known as Bonarda, but that is not Argentina’s Bonarda (which is actually Douce Noire). Valpolicella’s Coatina is also NOT Piedmont’s Bonarda (that would be Bonarda Piemontese). Croatina is rather the version of Bonarda that is also grown in Oltrepò Pavese—however…never forget that there are at least six different grape varieties that sometimes go by the name Bonarda. Crazy. Croatina is actually an interesting little grape, grown sparingly but across a wide swath of northern Italy, and often compared to Nebbiolo in terms of color and character. The name of the grape is derived from the term “Croatian girl,” despite the fact that it is believed to be native to Lombardy. What else is in a blend? 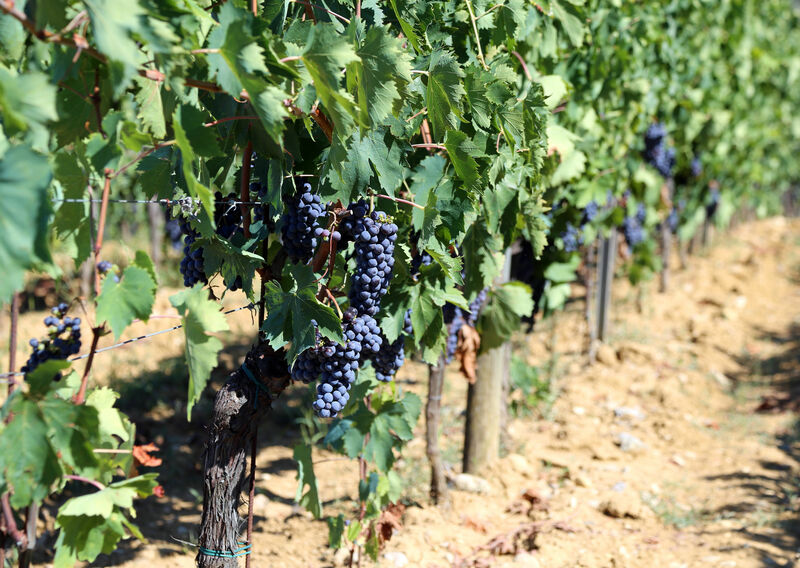 Other grapes that are allowed as part of the Valpolicella blend include Cabernet Franc, Cabernet Sauvignon, Sangiovese, Merlot, and Teroldego. For a more complete list, see the website of the Consorzio Valpolicella. 7 Responses to Valpolicella—What’s in a Blend? Please leave your personal “nicknames” to yourself when listing the grapes. As someone on the path of learning to be a sommelier, it is already hard enough to learn without having to figure out what you’re just making up. Thanks. Hi Jeff! Thanks for the comment, but in case you haven’t noticed, this is my personal blog where I am free to express myself. The”nicknames” I used (where the italics might give you a clue) helped me to remember the character of the specific grapes when I was studying. If you don’t find them helpful, you are more than welcome to not read nor follow my blog – but you don’t get to tell me what to do. The nick names and alliteration are a great mnemonic device and definitely helped me remember the “lesser” grapes! Wow, dude. Way to be a tool. If you don’t know that the name of the grape is “Corvina” and not “King Corvina” (which to me, nicely describes the grape’s role in the wine) – you need to start at the very beginning. Try this: wine is made from grapes. Tread carefully as you go upward and beyond. Jeff – you might do well to remember as you journey down your “path of learning to be a sommelier” that somms work with the PUBLIC and strive to give gracious SERVICE to PEOPLE. Maybe you should leave the snark behind with the beer bong. The best people in wine have 3 things going for them: 1) they are passionate, 2) They know a __load, 3) They have a sense of humor. Kevin Zraly is a great example, so….kudos to the responses. Sorry for the cliche but in Vino Veritas….